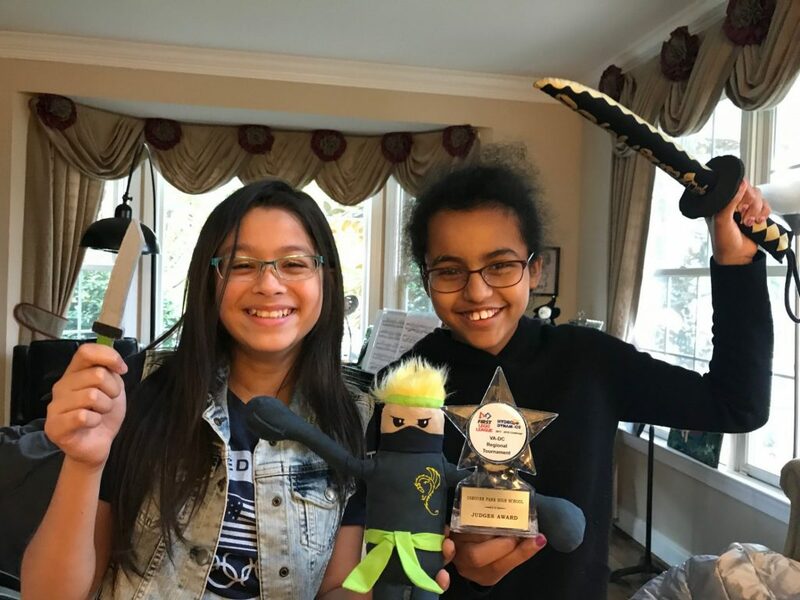 The Water Ninjas, an all girl robotics team, consisting of two NYSMITH students, Pari Rana (6A) and Amal Woolridge (6C) – along with three other girls from Loudoun county, took part in a regional robotics competition organized by FIRST Lego League (FLL). The competition was held at Osbourn Park High School in Manassas, VA where they competed against 30 teams. Water Ninjas’ excellent overall performance in robot design, research, and core values, earned them a 3rd place in the regionals. Their research on Arsenic Poisoning in well waters drew a lot of attention from the judges and other teams. Their creative and funny skit describing the problem and team’s solution won the Judges’ Award. As a result of being ranked 3rd out of 30, the Water Ninjas qualified to participate a state level competition to be held at James Madison University in Harrisonburg, VA on December 2nd and 3rd where more than 130 teams are expected to participate. Water Ninjas would like to say thanks to Nysmith teachers for fostering the passion for learning and problem solving.